Looks like the Gagarin in Space SSTV event ended up being a chance at random voice contacts with the Russian crew. 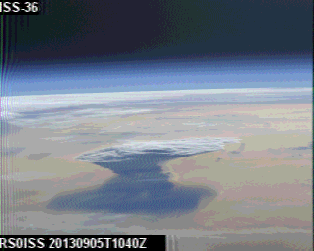 No reports of any SSTV activity today. 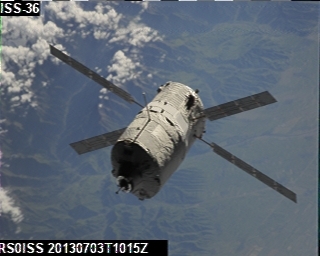 Just saw a report at http://amsat-uk.org/2013/10/28/iss-slow-scan-tv-active/ that SSTV may be active again on Oct 31 (09:25-09:45 UTC are the times indicated by the crew schedule) transmitting images of Yuri Gagarin. Images should be transmitted on 145.80 MHZ. More images transmitted today. Looks like SQ9MES is in a good location as he captured another set today. 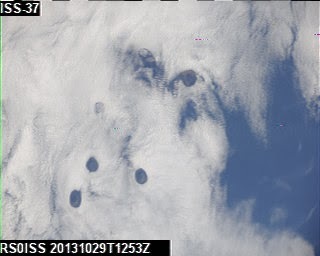 This image appears to be of some unusual cloud formations. 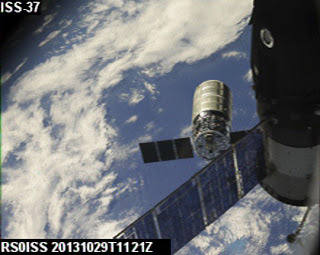 UB4UAD was able to receive this image of the Cygnus vehicle in close proximity to the ISS. Looks like the system was active as several images have been posted. 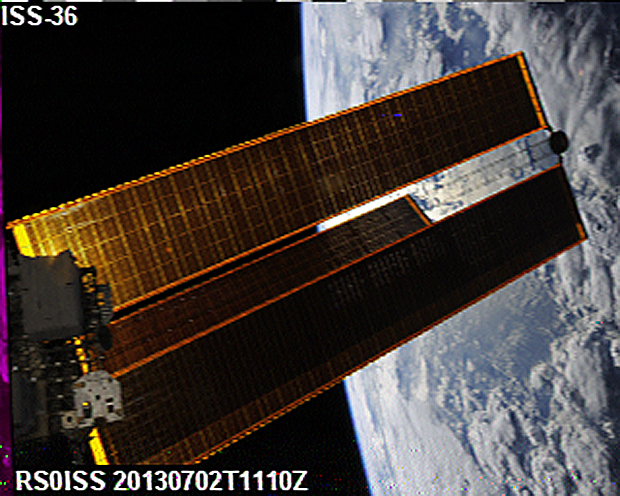 Additionally, the AMSAT Gallery is available again (through a redirect) so you can post additional images again at http://www.amsat.org/amsat/ariss/SSTV/ . 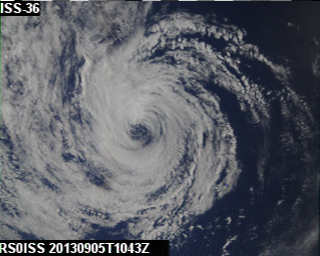 Below are a couple of examples of images received today. 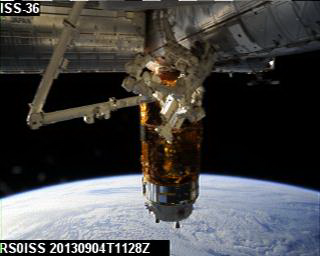 The first is a nice photo received by G7SVF of the solar array and the edge of the Earth as seen from the ISS while it is over the night side of the planet. The ISS would have been visible to folks at this time. This next one was received by SQ9MES and appears to be a view of one of the Soyuz vehicles with the African landscape as a background. 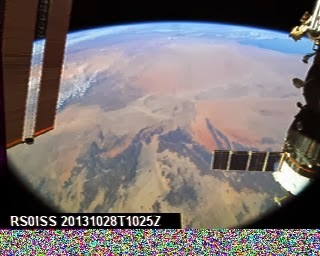 Looks like the Kenwood D710 will be activated on Oct 28 and 29 for some more SSTV imagery transmissions while the ISS is in range of Moscow. 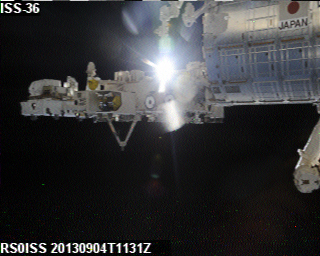 Planned activation times for Oct 28 are 10:25, 12:00 and 13:35 UTC. Activation times for Oct 29 are 11:15 and 12:50 UTC. Typical transmission windows are about 10 minutes and usually are done using Martin 1 mode. The down link frequency has historically been 145.80 MHz.